Here at the SOCAP10 conference, I'm struck by the number of deals that want to happen, are trying to happen, and, for all I know, may even be happening. I suspect, however, from the strained looks on the faces of many attendees, that the wannabes far outnumber the consummated transactions. One connection that isn't going to come together anytime soon is between aggregate demand platforms such as the Growth Philanthropy Network's Social Impact Exchange -- a clearinghouse of some 2,500 cross-sector members presenting carefully vetted investment opportunities in high-performing, growth-ready, scalable nonprofit organizations -- and aggregate supply platforms managed by national donor advised funds (DAF) like Schwab Charitable Fund -- which, according to its Web site, "has issued over 270,000 grants to 44,000 public charities - a total of close to $1.5 billion." GPN's Alex Rossides and Schwab's Kim Wright Violich led a discussion at SOCAP10 among a circle of nonprofits, funders and investors on the subject of "The Future of Aggregate Demand Platforms." It seems to me like an obvious match waiting to happen, one that could address the social sector's desperate need for more effective capital allocation, but if Schwab's perspective is emblematic of the industry, and I believe it is, the DAFs apparently don't see it that way. DAFs are in the aggregate supply business, and they have done an outstanding job in making it so simple and inexpensive for donors of all sizes and temperaments to take advantage of charitable tax deductions that they have been able to amass billions of dollars of assets in what are effectively mini-foundations for tens of thousands of retail customers. The DAFs have encouraged the formation of this sizable pool of money by simplifying paperwork and reducing cost, and tens of thousands of nonprofits have benefited from the ready availability and direct distribution of funds from these massive platforms. Unfortunately, DAF innovation is apparently confined to the core business of aggregating the supply of donor-managed funds, with little or none left over to think aggregation on the demand side, that is, to serve as the flagship customer base for aggregate demand platforms like the Social Impact Exchange. For perfectly understandable reasons, DAFs have always been ruthlessly agnostic (my term, not theirs) about the choices their customers make about which charities they want to support. While this is a defining characteristic of the DAF business model, without which many donors probably would not have felt comfortable parking their funds and creating a mass-market donation vehicle of such remarkable size, DAFs now seem disinclined to providing customers with even neutral information about the new wave of tools the nonprofit capital market is finally producing to enable more intelligent giving. That is not to say that DAFs don't get it, because they clearly do. Kim volunteered that improving the allocation of capital is the most important challenge facing the nonprofit sector, and she knows that the social sector will not advance social progress unless more money finds its way to more effective nonprofits. But even though Schwab says it "keeps a close eye" on developments in the burgeoning market of aggregate demand platforms like Alex's, and Kim sits on the newly-formed advisory council supporting research on what drives charitable giving (funded by Gates, Hewlett and LiquidNet), the DAFs don't seem ready to flag these opportunities for their customers. Creating a gigantic pool of charitable donations is no small accomplishment, but it seems a shame that the funds do not see themselves as having a role in guiding the deployment of the funds they've accumulated so brilliantly. Even if we only focus on charitable donations that are not already committed to specific organizations such as colleges, hospitals and arts institutions with which donors have strong loyalty-based relationships, philanthropy has tens of billions of dollars of essentially "dumb money" which stumbles around blindly looking for places to rest. Much of that money is "in play," in the sense that its final destination is potentially influenceable. The coordinated movement of that money to more rather than less effective nonprofits represents the untapped potential of informed giving. As the Hewlett Foundation put it a recent whitepaper, "Reallocating just 10 percent of the current $300 billion annual fund flow to the best performers would have a similar effect as raising billions in new funds—with nowhere near the same cost in fundraising time and energy." I understand why, as Kim said, the DAFs don't want to build intelligent-giving platforms themselves, but they don't have to. In the past, there was no way for dumb money to get smart, because nonprofits did not provide meaningful information about how well they were run or what they accomplished. But GPN's site is far from the only platform in the business of aggregating donor demand for growth-ready nonprofits, with the advent of actionable investment and evaluation resources from Charity Navigator, Philanthropedia, New Philanthropy Capital, Root Cause, GiveWell, GreatNonprofits, and many others. As a Hewlett-funded study of online giving platforms shows, the problem we face today is there are too many aggregate-demand platforms, none of which has the horsepower to provide donors with the kinds of information they need to easily find and fund more effective nonprofits. 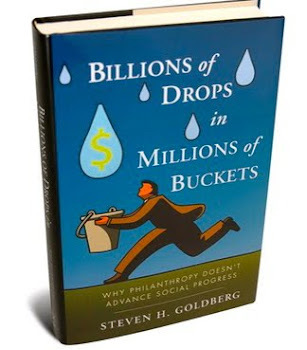 As a result of all this activity in measurement and evaluation, what once was an impossible task -- making informed judgments about which nonprofits can make best use of donors' generosity -- is on the verge of becoming commonplace. The "scaling what works" movement is well underway and it is ready, willing and able to move money to nonprofits that can produce the most social impact. But the transformation will not take place unless and until major industry players on the supply side -- such as national DAFs -- introduce their thousands of highly-engaged customers to the demand aggregators. Performance-based philanthropy needs the troops that DAFs have been recruiting. Far from interfering with donor choice or favoring some nonprofits over others, as the DAFs seem to fear, the demand-side platforms are positioned to be ideal partners for empowering donors who want to maximize the social impact their donations produce. Rather than join in as intermediaries on their customers' behalf, the DAFs seem to have made a conscious decision to sit on the sidelines just when the market is on the verge of taking off. Additional research on donor motivation makes sense, and capacity-building grants are always appreciated. But it does not make sense to defer building out a few of the leading platforms so the market mechanisms will be ready when we need them, and the most precious resource that these emerging marketplaces need is the customers base the DAFs have been building. Kim and Alex and their respective peers in the evolving but still siloed worlds of aggregate supply and aggregate demand platforms are plenty smart enough to find ways of creating additional value for their respective customers by the simple act of introducing them to each other. The miracle of markets depends upon the mediated interactions of sufficient numbers of diverse buyers and sellers. The nonprofit capital market works the same way, with donors acting as consumers of the valuable services the nonprofits produce. Performance-based philanthropy is an organized mechanism by which highly-effective nonprofits "sell" social impact to impact-maximizing donors. Those donors are searching for the very thing that aggregate-demand platforms bring together: a ready supply of high-impact nonprofits. But unless the markets attract donor-customers, the nonprofit-sellers have no incentive to show up either. This isn't a chicken-and-egg problem because both sides of the market already exist. They just haven't been introduced to each other. As yet, there's no philanthropy mall where lots of choosy donors know they can shop for lots of quality nonprofits. But surely Schwab and other DAFs have large numbers of retail customers who would love to shop at the aggregate demand platforms like the Social Impact Exchange, if only they knew it was there. So what's holding back the formation of this marketplace? It's not ignorance, it's not indifference, and it's not lack of resources. I don't really know what it is. But I do know this: it's not happening, at least not yet.